When making risotto, it’s a good idea to have all your ingredients prepped and near the stove before you get started because once you start stirring, you can’t stop! 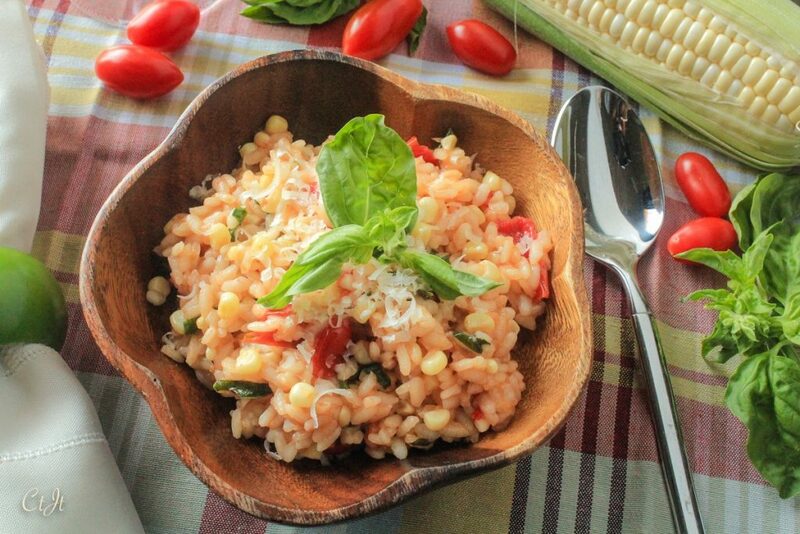 Make sure the heat isn’t too hot that the liquid absorbs too quickly or your risotto won’t be creamy. 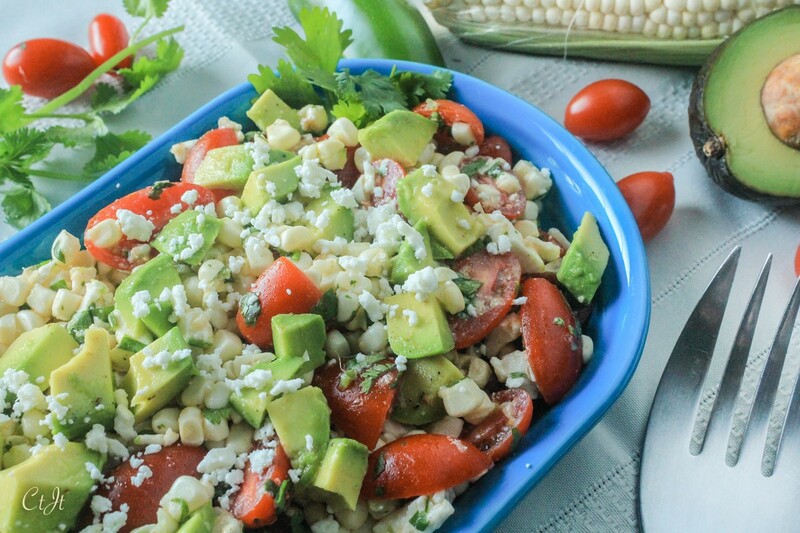 If you want more layers of flavor, roast the corn before slicing it off the cob. Serves 4 to 6. Directions: Add the stock to a saucepan over low heat to warm it and keep it warm throughout the process of making risotto. In a large deep skillet or dutch oven, heat the garlic oil over medium-high. When oil is hot, add the shallot, season with salt and pepper, and cook, stirring, for about 1 minute. Add the rice and stir to coat. Cook, stirring constantly, for about 2 minutes. Add the wine and stir while it is absorbed. When it is about all absorbed, add a ladle of stock (about 1 cup) to the rice. Stir, almost constantly, while the stock absorbs. When the spoon leaves streaky tracks on the bottom of the pan and most of the stock is absorbed, lower heat to medium and add another ladle of stock; stir while it cooks and absorbs. Repeat the stock and stir process one more time, then stir in the corn. Add another ladle of stock; cook and stir until it is absorbed. Test the risotto to see if it’s soft, yet firm (al dente). Add the tomatoes, green onions and cheese. Add more stock, if needed. The consistency should be creamy, not runny, and the rice will be a little firm. Add more stock if necessary and stir while it cooks and the liquid is absorbed. Remove the risotto from the heat. Stir in the basil; season with salt and pepper. Just before serving, drizzle with additional garlic oil and top with more cheese. Fresh, flavorful, perfect with fish or on its own. There is a nice heat from the jalapeños, and you can add more if you wish. Serves about 6. Directions: In a medium bowl, whisk together the 1/3 cup lime juice, garlic oil, vinegar, garlic, cumin, chili powder, salt and pepper until the mixture is thick and has a creamy appearance (emulsified). Set aside. In a large bowl, add the corn kernels, tomatoes, jalapeño, cheese and cilantro. Add about half of the vinaigrette and gently stir the salad together. Add more vinaigrette if desired. Transfer salad to a serving dish and refrigerate until ready to serve. Just before serving, slice and dice the avocado; gently toss with remaining lime juice. Top the salad with the diced avocado and serve immediately. Think of corn fritters as a great finger food for an outdoor grill party; these puppies pair beautifully with ice-cold beer. If you don’t want to serve them with the creamy chive & lime dip, you can serve them with warm maple syrup – the classic way to serve corn fritters. Adapted from Fine Cooking. Makes about 20 to 24 fritters. Sauce: In a small bowl, fold in the chopped chives, hot sauce and lime zest into the yogurt. Serve immediately or chill. 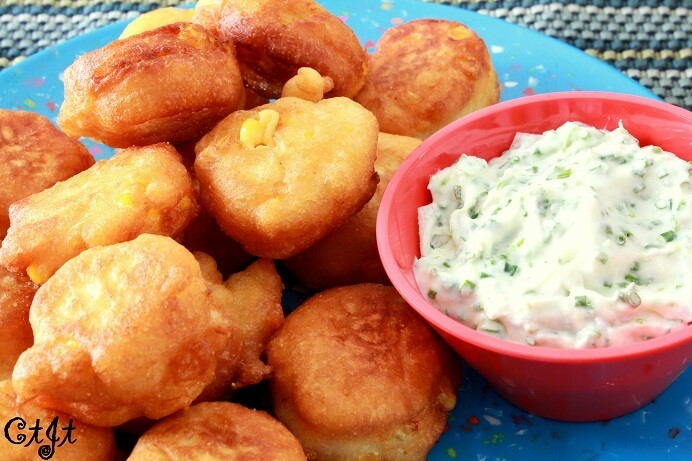 Fritters: In a medium bowl, stir the flour, cornmeal, baking powder, sugar, cumin and salt. In a small bowl, whisk the milk, yogurt and eggs. Gently stir the egg mixture into the flour mixture until just blended. Stir in the corn. Let sit for 10 to 15 minutes. Pour oil into a small, heavy frying pan, to a depth of 1/2 inch. Heat over medium to medium-high heat until it’s hot enough that a small dollop of batter sizzles when added (about 350°F). With a spring-lever miniature ice cream scoop or a tablespoon, scoop up a ball of the batter and gently release it into the hot oil. Add three or four more balls of batter to the hot oil, but do not crowd the pan. Reduce the heat to medium low so that the fritters cook gently. When golden brown on the bottom and barely cooked around the top edge, after about 1 to 2 minutes, use a slotted spatula to turn the fritters and cook until golden on the bottom, 1 to 2 minutes longer. Transfer the fritters to a wire rack set over a baking sheet and sprinkle generously with salt. *See cook’s note. Continue to cook the remaining batter in small batches, adding more oil as needed to maintain the 1/2-inch depth. *Cook’s note: You can keep finished fritters warm in a 200°F oven while cooking in batches. Note that fritters are best served immediately. To serve: Either dot the top of each fritter with a dollop of the yogurt-chive-lime mixture or serve it on the side for self-dolloping/dipping.